Is the Eurovision song contest rigged? 2008 results from Eurovision.tv, click to enlarge. So I created a simple visualisation of the data, similar to one of the approaches I use in my table planner software, PerfectTablePlan. In this visualisation I draw a line from each country to the country that it gave the highest points to. The closer the country is geographically, the thicker and bluer the line. Eurovision 2008 voting patterns. Click to enlarge. Looking at the diagram, there does appear to be bloc voting going on in the Balkans, Scandinavia & the former Soviet Union. But what would the voting look like if there was no bloc voting? To find out I randomly swapped columns in the table. For example votes made by the UK I assigned to Belarus and votes made by San Marino I assigned to the UK. So each finalist now has the same number of incoming votes, but from random countries. Assuming they are voting for the best (or least awful) song, not by geography, the results should look similar. The randomised version looks more, well, random. 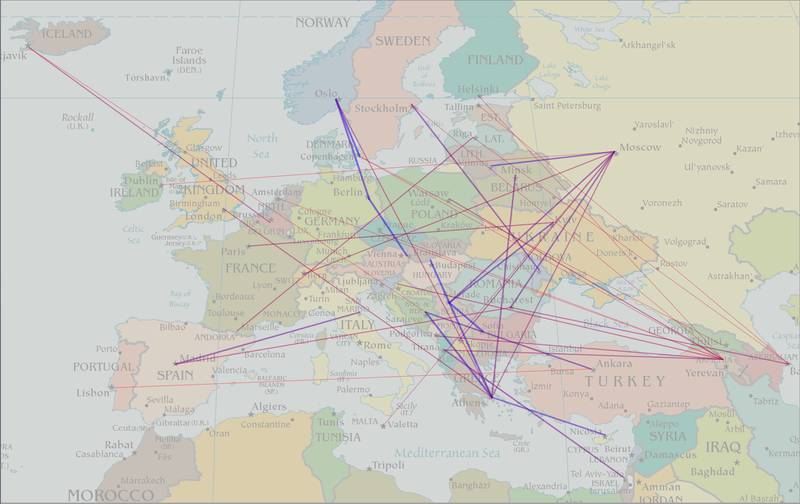 Randomised Eurovision 2008 voting patterns. Click to enlarge. These results are suggestive, but not conclusive. But If I put the last 3 year’s results together with their randomised versions, I think there is little doubt that geography is the key factor in determining Eurovision voting patterns. The actual voting patterns look remarkably similar year-on-year and the difference between the actual and randomised results are quite marked. 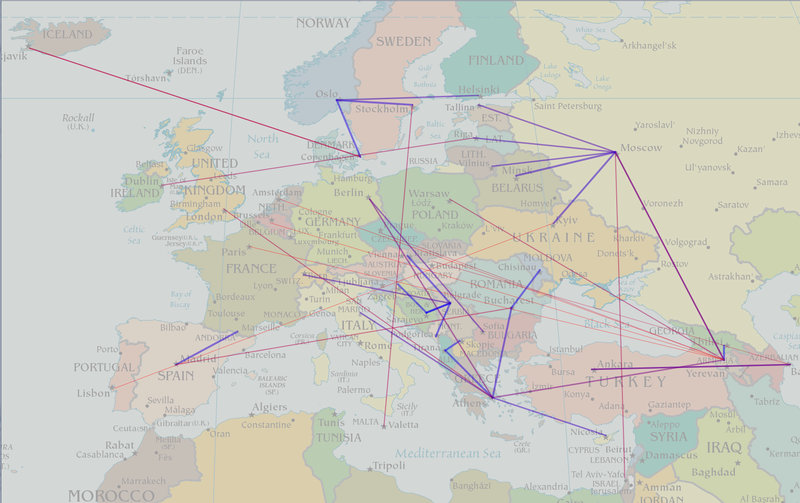 Eurovision voting patterns, actual and randomised, for 2006, 2007 and 2008. Click to enlarge. Does it really matter whether Eurovision song contest voting is based on merit? It certainly won’t keep me awake at night. But I think it is a nice illustration of how you can use simple visualisation techniques (even something hacked together in a few hours) to turn raw data into usable information. The human brain has incredibly powerful visual processing hardware. Have you optimised your software to run on this platform? I wrote some throwaway code to generate these images in C++ and Qt over a few hours on a wet bank holiday Sunday. QA amounted to ‘that looks about right’. I’ve never heard of it either – but apparently it gets as many votes as the UK. 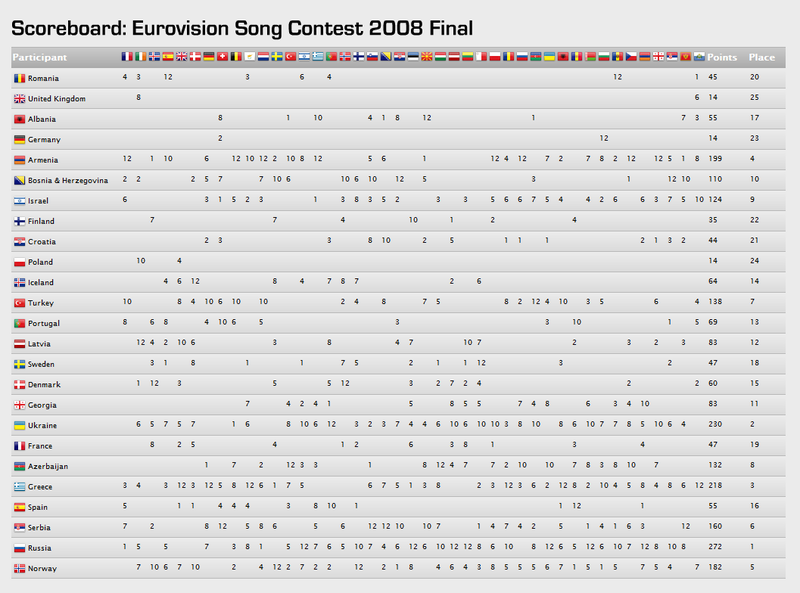 This entry was posted in miscellaneous, software, usability and tagged eurovision, usability, visualisation, visualization, voting on 26 May 2008 by Andy Brice.